:: Construction Graffiti ::: YIKES! "You may have seen this photo months ago. I posted it after we left Valencia (where it was taken). It is the picture I've been meaning to send you for CG Naturally I think this is a great fit for CG and I hope it makes the cut. Wow. FotoPRIX? That's kind of funny. 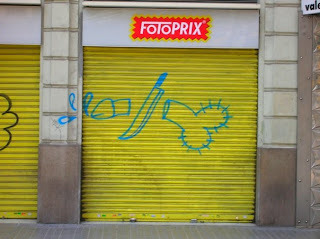 Thanks to PC for your crazy Spaniard graffiti!